The Fakir of Venice is a story that revolves around two central characters—a film production fixer, Adi Contractor (Farhan Akhtar) from Mumbai who's hired by a Venetian art house to provide them with a genuine fakir for an art installation project, and a slum-dweller and daily wage labourer Sattar (Annu Kapoor) whom Adi hires to be that fakir who'd go to Venice with him, thinking that the duo could con the European art world in exchange for good money. The film keeps one intrigued throughout the first half. A fakir whom the Venetians are looking for as a live exhibit, must be someone who dives neck deep into the sand and stays there still, for hours on end, without food and water. They've only seen such a man in pictures. Adi, a maverick, who prides himself on his ability to get anything a film production crew can ever ask for, from transporting a monkey across the border to sourcing pink elephants, accepts the offer in exchange for a handsome paycheck which will later, sponsor his dream of studying film making in New York. Adi hunts for the 'typical fakir,' who must have given up on all material things, to lead a minimal life, standing upside down with his head lodged in the ground for most of his time. However, when he is unable to find the fakir, he decides to fake one. And therein comes Sattar, a naive, middle-aged man, who accepts the offer—of remaining buried in mud for over five hours straight, everyday for seven weeks inside the concretised, high-walled and closed enclosure of the art house—as a way of pulling his family, back in India, out of the circle of poverty. The film is entirely based on the chemistry the duo shares and the play of human emotions involved therein. While Sattar keeps hinting at his failing health multiple times in the film, Adi chooses to either ignore it or show total indifference to it, blaming it on his alcohol addiction. He fails to understand that while Sattar willingly acts out his own death everyday in exchange for a meagrely sum of Rs 25,000 rupees, its actually a nightmare which he'd rather escape—for one, it is the one major cause for the declining state of his lungs as per what the doctors have told him and two, he was at the wrong side of age. The film keeps the viewer gripped all along but fails to keep the momentum going towards the end. It is as if the makers simply did not know how to handle the closure. They threw in a sudden change of heart in Adi, without providing the right context or explanation for the same. This Anand Surapur's directorial debut, was meant to be Farhan Akhtar's first acting role, which never took off at the time. Though the latter does justice to his role, in that, he is every bit convincing in the form of Adi, the trickster and conman, he fails to keep up the act towards the end when Adi is supposedly feeling close to Sattar and getting into his frame of mind. Annu Kapoor is stupendous as Sattar; very relatable throughout the film. 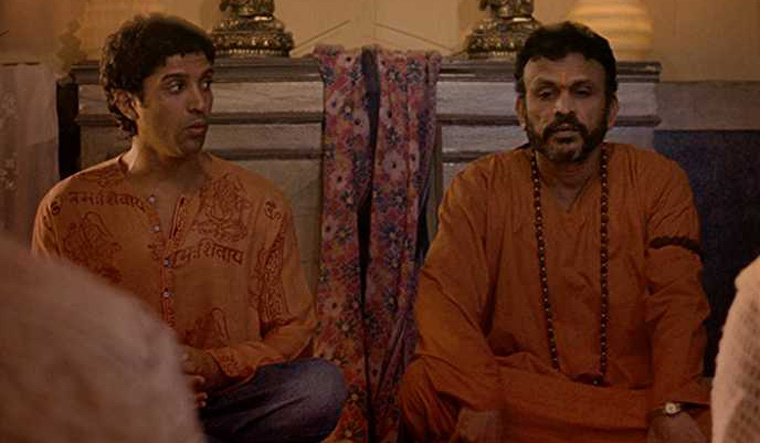 The Fakir of Venice is a decent one-time watch.